We understand that the last thing any start-up wants to worry about is tax compliance, especially when you have so many other things to worry about. Like product development, sales, recruiting, etc. But it is wise for a start-up to think about compliance early on to avoid potential penalties and distracting complications from lack of compliance later down the road. If you don’t know about an issue ask a professional like your lawyer, accountant, etc. Here is a little background on 409A valuations and choosing the right 409A provider. 409A refers to Section 409A of the Internal Revenue Code for the Internal Revenue Service (IRS) of the United States of America. This code governs the taxation of non-qualified deferred compensation. Section 409A was added to the Internal Revenue Code in January of 2005 and issued final regulations in 2009. Stock options give employees, consultants, etc. (any grantee) the right to buy stock at a predetermined price (the strike price). But you first need to determine what the strike price should be. The IRS 409A regulation stipulates the strike price must be equal to the Fair Market Value (FMV) of your company’s common stock. But how do you value the company stock, especially if the company has a complex capital structure (i.e. has raised money via equity or debt)? Third party valuation firms with experience in these valuations are your best bet for staying compliant. But be careful. Not all firms are created equal. There are three “safe harbor” methodologies provided by the IRS regarding setting the fair market value (FMV) of common stock for privately held companies. Almost all VC or angel-backed startups follow will use a third-party firm and follow the Independent Appraisal Presumption: A valuation performed by a qualified third-party appraiser. 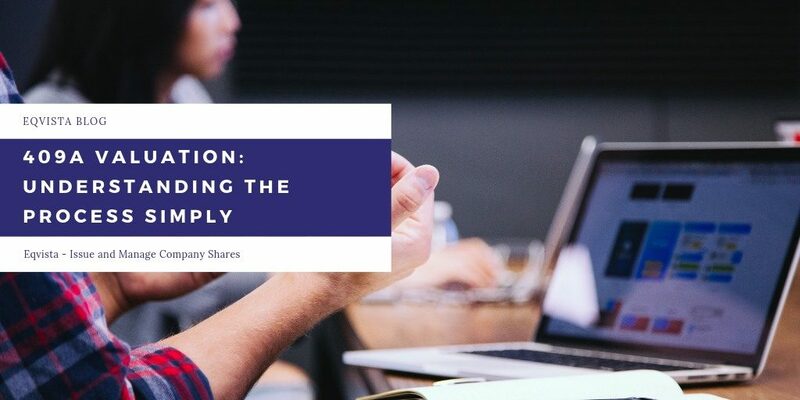 The valuation is presumed reasonable if the valuation date is set no more than 12 months prior to an applicable stock option grant date and there is no material change from the valuation date to the grant date. If these requirements are met, the burden is on the IRS to prove the valuation was “grossly unreasonable.” If the valuation does not fall under “safe harbor” then the burden of truth falls on the taxpayer. There are severe penalties for Section 409A violations which include, immediate tax on vesting, additional 20% tax penalty, and penalty interest. Ideally, safe harbor insulates you from persecution. Luckily, IRS has provided avenues for companies to safely offer deferred compensations. If you have a safe harbor, IRS will only reject the valuation if they can prove that it is grossly unreasonable. The burden of proof is with IRS to prove that you are in error. However, this burden of proof is shifted to the company and BOD if don’t have safe harbor. In this case, you are treated as having granted cheap stock unless you can prove otherwise and defend your strike price. The individual appointed to do the valuation must have at least five years’ experience in a field related to valuation. This includes business valuation, private equity, investment banking, secured lending, or financial accounting. This can be tricky because there is room for subjectivity. IRS, upon its discretion, may determine that the individual who did the valuation did not meet the required standards. Further, what we have seen too often is the internal valuation results in values way to high or just plain wrong. Experience matters. With the requested information, a qualified firm can do a reasonable valuation. In some instances, a third-party firm may arrive at a favorable fair market value without going too low to raise the alarm. For a company to be deemed as independent, in IRS context, it should only provide you with valuation services. Some companies may be tempted to register a separate LLC company to handle valuations, but the conflict of interest is their regardless. Legally, conflict of interest indicates the presence of economic benefit. In that case, IRS requires valuation firms to declare that there are no relations with their clients. On top of this, they should also attest that the compensation is not based on the results they deliver. The bottom line is that you will not achieve safe harbor if is there is a conflict of interest. If there is material change that might have a direct impact on the value of the company, then the valuation will become invalid. The valuation is valid for 1 year, so if you are issuing additional shares after 12 months, then you should do a new valuation. In order to get a 409A valuation you want to work with a reputable firm that has experience in rendering valuation opinions. We recommend staying away from 409A only shops, firms that are not independent, or are “giving away” in conjunction with a software sale. Please talk with one of Meld Valuation’s valuation experts. It can be difficult to know what market or fair prices for valuation services are if you have not had experience with these services before. Below we are presenting what we feel are middle of the road prices for quality service and reports with technical rigor that would pass a big four auditor. You can find cheaper, but you run all kinds of risk for our company, employees, and board. No matter what, make sure you choose a valuation firm you trust and that you can see yourself having a good relationship with because that relationship may be a long one. If you’re ready to get your 409A valuation and start issuing stock options to employees, schedule a call with Meld Valuation today! 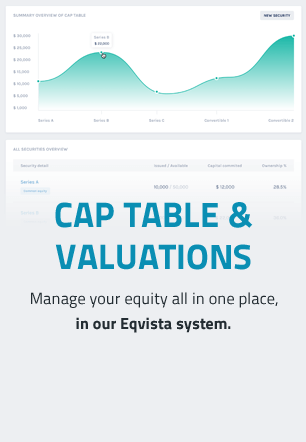 EQVISTA has partnered with Meld Valuation to provide it’s clients with premier independent business valuations. Through this partnership companies from seed-stage to pre-IPO can manage both their equity and valuation needs in a single scalable solution.